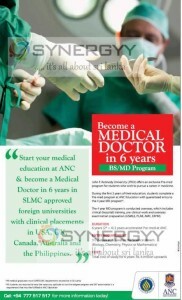 Start your medical education at ANC &. become a Medical Doctor in 6 years in SLMC approved foreign universities with clinical placements in USA, UK, Canada, Australia and the Philippines. John F. Kennedy University (JFKU) offers an exclusive Pre-med program for students who wish to pursue a career in medicine. During the first 2 years of their education, students complete a Pre-med program at ANC Education with guaranteed entry to the 4 year MD program*. The 4 year MD program is conducted overseas, which includes clinical (hospital) training, pre clinical work and overseas examination preparation (USMLE, PLAB, AMC, ERPM). Education SynergyY © 2019. All Rights Reserved.